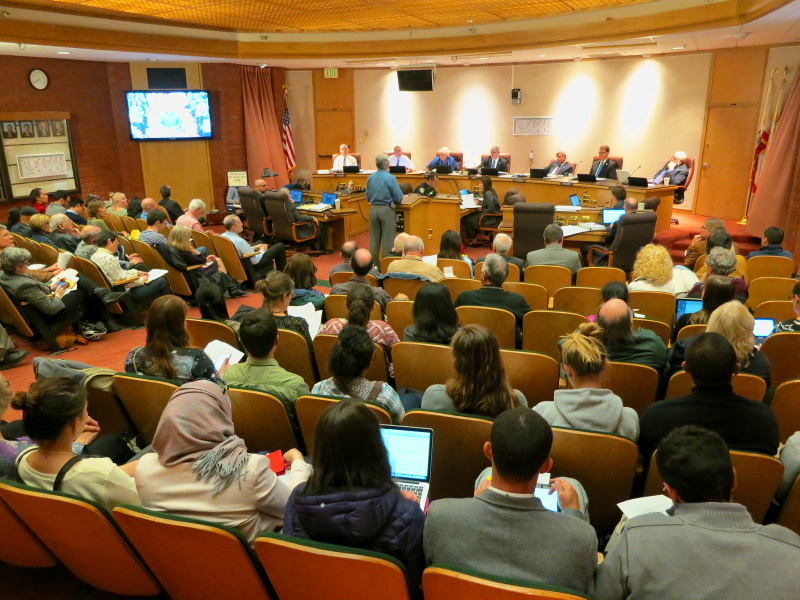 The Sunnyvale City Council voted 4-3 last month to oppose dedicated bus lanes that could cut transit riders’ trips nearly in half along the length of El Camino Real, making bus trips almost as quick as driving. More than one council member said the city shouldn’t invest in transit because self-driving cars are going to make it irrelevant. The city’s “officially preferred alternative” for the Valley Transportation Authority’s future El Camino Real bus service would include new bus stations on sidewalk bulb-outs, but not bus lanes anywhere between Palo Alto and San Jose. This “mixed flow” option, which would leave buses stuck in traffic, would shave just 4 to 5 minutes off the current 70- to 85-minute bus trip during morning and evening rush hours. By comparison, bus-only lanes on El Camino Real would slash rush-hour trip times by 25 to 35 minutes, according to the project’s Draft Environmental Impact Report (EIR). Converting two of the street’s six traffic lanes to exclusive bus lanes would bring 6,000 new weekday passengers to VTA’s El Camino Real buses in 2018, and another 12,000 on top of that by 2040. The Bus Rapid Transit project is the longest of three BRT lines planned by VTA to span Santa Clara County, converging in downtown San Jose. “The travel time savings from a bus today to a dedicated lane bus would be so significant that it would make it an alternative for people who don’t see it as an alternative today,” Sunnyvale Public Works Director Manuel Pineta testified at the City Council meeting. 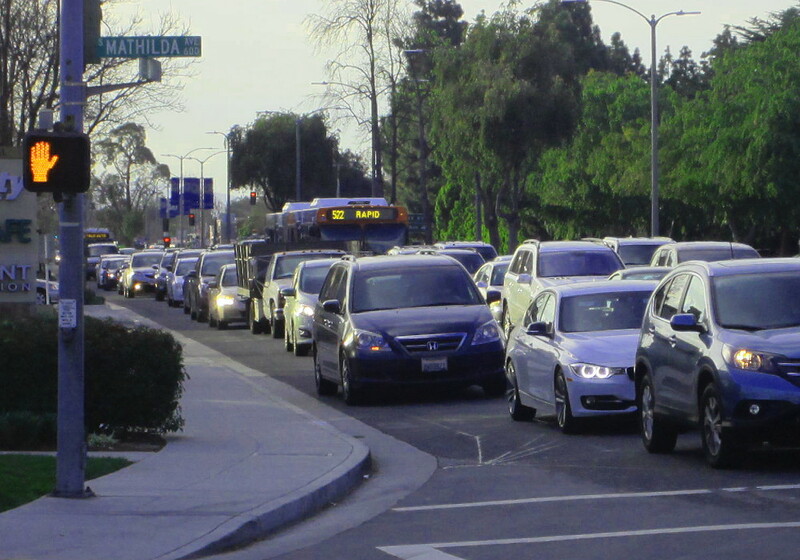 VTA expects weekday traffic volumes on El Camino Real to drop by up to 4,500 vehicles in Sunnyvale and 5,600 vehicles in Mountain View if the dedicated bus lanes are built, as some drivers shift to transit, bicycling, or walking, and others choose different routes. Car congestion on the redesigned El Camino would increase only slightly, with rush-hour driving trips from Palo Alto to San Jose taking 37 to 44 minutes instead of today’s 36 to 40 minutes. But after hearing two hours of public comment, with 30 speakers in support of the proposed bus lanes and 20 speakers opposed, City Council members David Whittum, Glenn Hendricks, Jim Davis, and Pat Meyering dismissed VTA’s analysis. Speeding up El Camino Real buses through Sunnyvale, they said, isn’t worth the “broader impacts” on the city. “Let’s make improvements to public transit, let’s give improvements to the current and future riders of the service, but not going the step to dedicated lanes,” said Hendricks, who along with Meyering argued that the “mixed flow” improvements proposed by VTA are good enough. Some council members dismissed better bus service entirely as impractical and outdated, despite the repeated success of dozens of rapid bus projects worldwide, and pointed to self-driving vehicles as a more appropriate transit solution for Silicon Valley. Not only are self-driving vehicles many years away from hitting the market, let alone saturating it, but even in a hypothetical future with autonomous vehicles, the geometric reality is that cars take up far more roadway space than buses, and the financial reality is that many people won’t use them. Not every official wanted to leave buses stuck in rush-hour traffic. A project without bus lanes “doesn’t give people any option that approaches automobiles’ usefulness,” said Vice Mayor Tara Martin-Milius, who voted against declaring a preference for the “mixed flow” option, along with Mayor Jim Griffith and Council member Larssen. “The transit dependent are not going to do any better than what we’ve got right now, and I don’t think that’s good enough,” she said. In early January, Palo Alto’s City Council also recommended against dedicated bus lanes for El Camino Real, but Mountain View and Santa Clara haven’t taken a position on the project’s design. Later in March VTA staff will choose whether or not to recommend pursuing bus lanes — and for which sections of the street — to the agency’s Board of Directors, which is expected to review the BRT project in April and select a design alternative in June. This sort of anti-transit nonsense is why I’d never consider taking a job in San Mateo or Santa Clara counties. Don’t want people to get to work? Okay, we’ll take our business elsewhere. Self driving cars are coming, so why don’t we prepare by trimming some extra car lanes? After all, they’ll make much more efficient use of them. Amazing how Sunnyvale politicians can put so much faith in a technology that is barely proven. The Babbittry of Silicon Valley should not be underestimated. Los Altos will be voting on the project tonight, and Mountain View is expected to vote on 4/21. When the magical flying unicorns come to save our city from itself, nobody will want these silly old burros getting in the way of their glorious wingspans during takeoff and landing. They don’t want “those people” in their cities. It is better to pretend they do not exist. You should invest in bus-only lanes today so you can make them self-driving taxi lanes tomorrow. Even in Sunnyvale, what kind of people do you think will be riding around in self-driving cars, especially in the first couple of years? Do you think they will have more in common with Tesla drivers or those riding VTA buses? That’s even more likely for those who aren’t taking the bus by choice. Even if you think semi-common use of self driving cars are just around the corner, how long before transportation is improved for everybody.? Stop leaving transit oriented people in the dust, and stop politicians from meddling in transit policy. This is a corridor that should be done right, and with the foresight of future users. We cant expand our way out of traffic, and the cost of bus lanes are minor compared to alternatives. Try it, and if doesn’t work get rid of it. But likely it will work. We cant succumb to the loudest voices, but the voices of reason, those of fact, not fiction. “nobody rides the bus.” ie “nobody” rides the bus. decision-makers are showing who they think counts. There are a couple of flaws in the current bus lane proposal. The biggest one is that the exclusive lane would only be used for rapid service (stops once every mile) only and keep the local service on regular lanes. I think this makes the ridership projection less favorable (because there will be less service) and taking more space on the roads from auto than necessary (you still get slow buses weaving in and out of traffic with cars). I think there should be twice as many stops on the bus lanes and get rid of local service. The second flaw is that despite the exclusive lanes, the only route would be the existing 522 to Downtown and East San Jose. If bus lanes can significantly reduce operating costs, the savings should be reinvested via new routes to/from other parts of the county that partially use the exclusive lanes (i.e. Milpitas to Stanford Industrial Park via San Tomas and El Camino). Cities like Mountain View, Palo Alto, and Sunnyvale are relatively wealthy and things like VTA buses are not considered mainstream if they’re not kids going to school. The two California examples of on-street BRT busways are built/to be built in economically depressed areas (East Oakland, and San Bernardino) so bus usage is considered more mainstream but still not without controversy. AC Transit tried to implement bus lanes in the wealthier Berkeley and it got shot down. I wouldn’t say that these cities are exactly anti-transit though. If it is Caltrain, it is fine, light rail, fine, Google buses and private shuttles, fine. It is a class issue. Well KQED reported that the people who took out the advertising in the newspaper are… car dealers. Surprise surprise. We need more people like you living here, Mr. EricSir, so that you can help us elect transit-friendly, bike-friendly, walk-friendly representatives to council. Why does everyone assume self-driving cars will mean less need for mass transit? If anything, it’ll just make owning a car less desirable by driving down the operating costs of buses and taxis. And once you have a considerable chunk of Americans choosing to forego car ownership, they’ll soon realize that walking, cycling and riding the bus is easier on the wallet. Funny thing is some of these communities actually want this, they already have enough companies in their tax base to pay for basic services so any new companies or employees just represent more congestion and higher housing prices, they won’t build new housing or accommodate more travelers so the vicious cycle continues, they don’t want to be part of “development” in any way. Thinking that self driving cars will solve anything is delusional, straight up. The point is we need and will get much higher densities of housing near our major transit lines like El Camino Real. 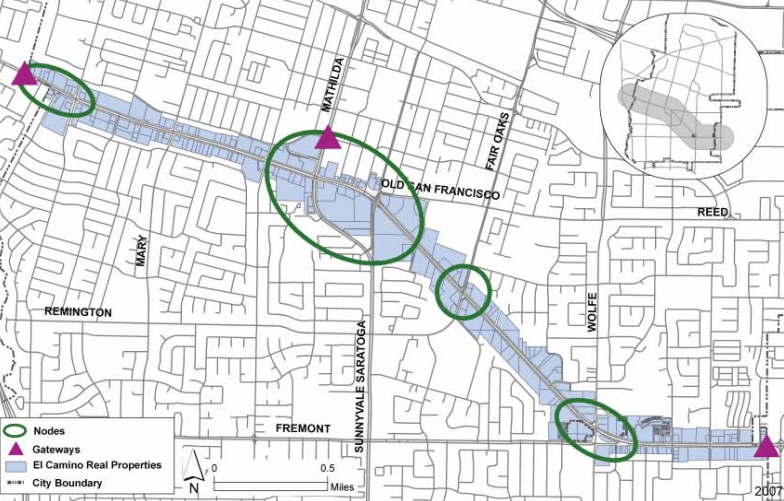 Ideally we’ll have multiple BRTs use El Camino Real as a backbone. The car (self driving or not) just perpetuates gridlock without a sustainable solution. BRT is meant to basically be the poor [transit] man’s LRT and most LRT systems don’t have stations much closer than a mile, hence the same spacing with BRT. So far in San Bernardino, ridership isn’t exactly Orange Line levels, but it has exceeded estimates. However, part of the reason for that is the lack of connections. The project was originally planned to open concurrently with a new Transit Center, but then that project got delayed to coordinate with two other projects, so they had to finish and open the BRT ahead of it to avoid losing the grant monies. Fortunately, that situation is on track to end in a few more months. There argument fails the logic test. Self-driving cars will almost certainly mean that the current streets are vastly overbuilt because they’ll be able to operate more efficiently in the space and not need as many lanes. Why are we talking about autonomous cars? The Rapid bus lane is a great solution to the private SOV auto. It’s too bad that so many commuters in the So. Bay are so shortsighted and environmentally hostile. Bus-only lanes will bring El Camino to a near standstill. Even crossing El Camino will be delayed greatly. This project is designed to ensure long–term dependence on buses and the over-paid bureaucracies in charge. If the VTA operated stagecoaches drawn by donkeys, it would install donkey stagecoach-only lanes everywhere it could.